Ok, so that title is a bit of an exaggeration but fits in with my current mood. I'm cranky and feel like griping. 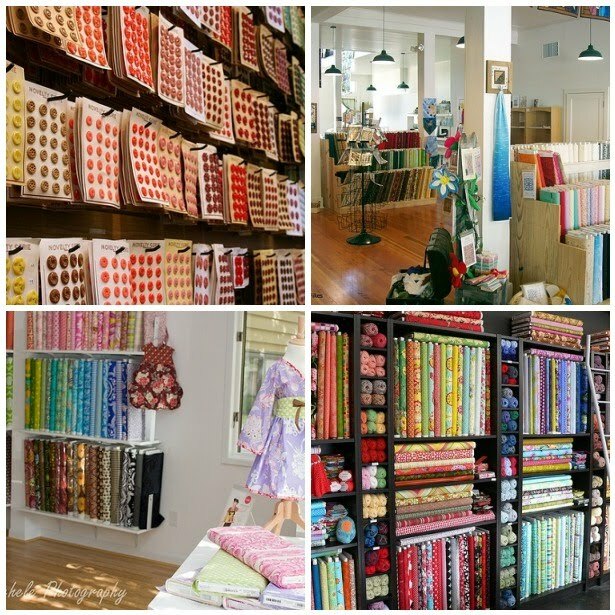 I would kill to have an awesome, fully stocked fabric shop like the ones in the photos in my town. Twice this week my creative plans were dashed by the fact that unless you scrapbook, there are no places in my area to get proper sewing supplies or fabric! And it's only going to get worse. The local quilt shop just recently went out of business. The chicks who work in the fabric department of Hobby Lobby said they won't be carrying as much interfacing type stuff anymore, and Walmart has plans to do away with their fabric department altogether. Granted, Walmart's fabric department is pretty craptastic, but still. I take what I can get, ya know? Grrr. All I wanted was some Timtex/Peltex (out of stock at Walmart and no longer carried by the HobLob), elastic thread, and some grommets. I broke down and ordered the Peltex online but thought surely elastic thread was a commonplace sewing notion. Big fat NO. I got strange looks when I asked for it. Elastic thread. . . a mythical creature, who knew? Anyone else live in a sewing supply black hole? Do you just break down and order everything online and pay crazy shipping? For instance, I can get a spool of elastic thread online for about a $1.50, but the shipping is $4. Wha? I must start planning ahead. No more sewing on a whim. So, why the big need for elastic thread? I have some shirts I want to refashion/reconstruct for myself and I really want to try Dana of Made's Summer Vacation Dress Tutorial. SO cute. Guess I'll be taking a road trip in the next few days. Yes, I have to drive at least 45 minutes to get to the closet Joann's. 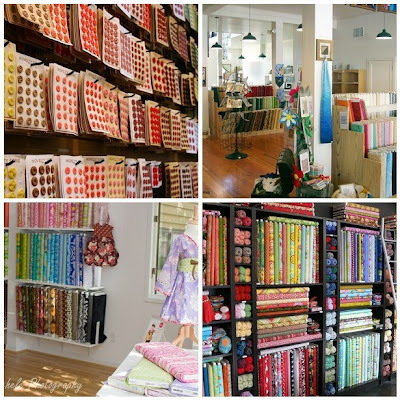 If I want to go to a cool ,hip, independently owned fabric shop, I have to drive at least 2 hours! That is a long way to go with a McScreamy toddler in tow. Trust me, I know because we tried that once. Maybe I should buy a lotto ticket while I'm in Georgia and that way, if I win, I can open my own fabric shop/studio! You poor thing! And I thought I had slim pickings with my 1 JoAnn's and 1 local quilt shop. I get terribly jealous when I read about the girls in the Midwest and out West who have several shops nearby...my "quilt shops" are on Etsy! we have a small quilting shop here...but it's not exactly "Hip" iykwim. Older ladies run it,and they're not real up with the times. So i'm right there with ya. I'm laughing but I know it's not funny!! I do have a couple of really good quilt shops in short driving distance that keep me sane! Yikes! I would die with out my JoAnns. As much as it is a love/hate, I need them for the basics. Please let me know if you ever want me to stock up for you during one of their sales and send to you in a flat rate box. Seriously, I'm there ALL the time and wouldn't mind one bit! oh, honey. I too live in a dark whole of terrible. It's SO HARD to find things in this little indiana town. The really good supply stores are an hour away. I will tell you though, i've had great luck finding random things at thrift stores. There's always bags of thread and notions for super cheap. I've stocked a lot of my supply closet with thrift store finds. Give that a shot! oh, also. thanks for having such an amazing blog! Andrea- Thanks for the sweet offer! I should be able to make another trip to Joann's soon though. I'll just need to make sure to grab anything and everything I *think* I may need. Laura - I have found a few things at the thrift store. Vintage buttons and a big bag of zippers were probably my luckiest finds. I'll need to go by there again soon. Since my daughter has hit that terrible 2 phase, we haven't done as much thrifting. If there is any place she hates more than a fabric store, it's the thrift store! Yikes. Thanks so much for the lovely compliment-definitely nice to hear. I feel your pain! We don't have a JoAnn's or a Hobby Lobby or anything like that, and our quilt shops are all "old lady" shops (no modern fabric!!!!) It's so frustrating! I so wish I lived in a big city with all it's fabulous big-city offerings! At least I can get interfacing at WalMart, but it's not exactly a source of inspiration! Trust me, I know what you mean! I use to live in an itty bitty town in Kansas and the only place to get craft stuff was at Wal-Mart and then they scaled back their craft section! I had to drive almost an hour just to go to a Hobby Lobby. More craft stores has been my favorite thing about moving to a bigger city lol. I have the same problem trying to get some Fast2Fuse! For you elastic needs, would Shirring elastic do the trick? Its basically is elastic thread to do shirring and smocking with. This sounds like an opportunity to me...perhaps those of you living in similar marketplaces could collaborate on micro stores (group purchasing, marketing, etc.) If the big guys aren't willing to supply the demand, why not you? In Western Canada we are limited to one craft chain (Michael's) and one fabric chain (Fabricland) with the odd specialty hobby shop. I'm sure you talented folks can do it! Start small and build what you want. Everyone loves to support local independent businesses if you make it easy for them. Good luck!